 Count number of traveler in team then enter www.airporttransferphuket.com for booking online.  Any last minute bookings, please call +66 89 078 6220 at least 4 hours.  The booking is fully confirmed and voucher will be issued after payment has been completed and receive of payment confirmation from PayPal or PAYSBUY.  20% of total paid amount is chargeable for any cancellation made more than 24 hours or longer.  Fully charge for any cancellation made less than 24 hour prior arrival time or No Show.  The first option to make payment to confirm your taxi transfer booking is Pay Pal.  The refund has to be agreed by both seller and buyers only.  Company will refund in case that cancellation is made with company acknowledment minimum 4 hours in advance before the appointmen time only.  Refund will be required to PAYPAL within 24 hours after cancellation with refuns is agreed by both seller and buyers.  The refund will take minimum 7-14 day or longer for the process depanding on type of bank and the countries of the credit card.  The refund fee will be deducted from the paid amount at lease 3-5% as transaction fee everytime. By this, the total refund amount will be less of bank charge. Security policy for using credit card.  Our payment process is secured system. Company is unable to collect your credit card information and the payment will be made directly to PayPal only.  Since company has no chance to see card information therefore personal information is guaranteed for best security protected. 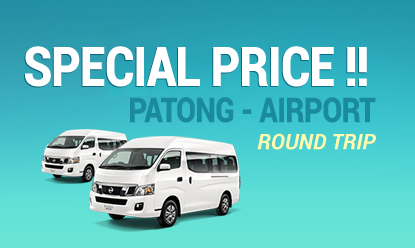  For your best comfort and safety, there are maximum numbers of passengers for each type of vehicles. Should the number presented exceed the number stated on detail showing on website and voucher, we reserve the right to not carry the additional passengers.  We reserve the right to change vehicle type to be higher category as per our availability. Of course, the provided vehicle must be higher category. Additional service apart from above list is required to check for additional charge.  After our client acknowledge, accept our term and the payment has been completed, Airporttransferphuket.com, its agent and suppliers will provide transportation service with driver. To making arrangements for transportation and services shall not be liable for injury, damage, loss, accident, delay or irregularity, liability or expense to person or property due to act of default by any other company or person providing services included in this transfer.  Airporttransferphuket.com, its agent and suppliers will be responsible for issuing voucher and provide all transfer details, itineraries, with terms and conditions specified in taxi transfer information to our passengers.  Specifically, Airporttransferphuket.com, its agents and suppliers accept no responsibility for any sickness, pilferage, labour disputes, machinery malfunction, government actions, acts of war or terrorism, weather conditions, defect in any vehicle of transportation or for any misadventure or casualty or any other causes beyond their control.  We will put our effort to ensure that our taxi service will arrive on time. The company shall not be responsible or liable for any delay occur which happens beyond our control.